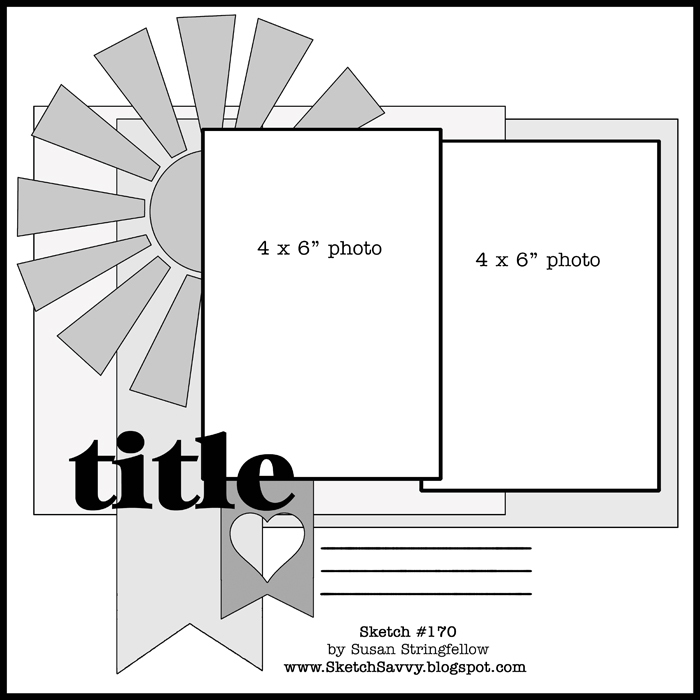 I love working with sketches – I find they make scrapbooking and card making fast and easy. I used to worry that the layout wouldn’t feel like my own, but I realized quite quickly that I didn’t need to to take all elements of sketches – sometimes I flip or rotate them, sometimes I take one element from them, sometimes I just use the sizes of papers as a guide. In any case, I find that using a sketch quickly gets me past the point when I stare blankly at my pictures and supplies. Each month DCWV hosts a sketch challenge. They post a sketch for both a card and layout and challenge you to use your materials and get crafting. There are goodies up for grabs too. So if you are feeling like crafting, need sketch to get the juices flowing, than the DCWV August Stack-a-holic challenge might be for you! Okay, now you might be thinking – ummm, Karen, that doesn’t look anything like the sketch! To some degree, you are correct! I actually decided to rotate the sketch 180 degrees, using the flowers and fruit to create the focal point like the sun does in the sketch. Then, I simply took some of the elements (flowers instead of the title; little flower on the banner pieces instead of a heart) and I was all set. Oh, and can I just say that this fruit themed paper from the DCWV Watercolor stack is really all sorts of cute (You can get it at JoAnn – it was on sale last time I checked). So, if you are interested in the challenge, make sure you head over and check out the post. You will find the card sketch there as well, and amazing samples from the team (including a card from me). This entry was posted in DCWV, Page Layouts, Scrapbooking and tagged DCWV, layout, stack-a-holic challenge, watercolor by Scrappy Canuck. Bookmark the permalink.